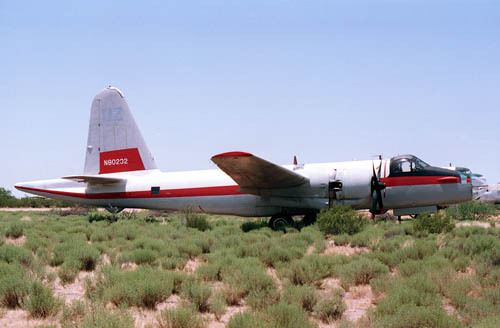 I had ghost towns, enchanting scenery (White Sands NM) and Billy the Kid folklore on my mind during this trip, but the encountered vintage propliners in Florida in 1992, had sparked an interest in the histories of these aircraft. It was therefor no coincidence that I found a few more "propliners" on my path during this trip. P2V-7 N918AP (cn 726-7186) of Black Hills Aviation. Photo was taken at Alamagordo Airport, which I went to check out by chance. Forest Service Must Pay $3.5 Million In Airtanker Crash - MISSOULA, December 4 - A federal judge has ruled the US Forest Service must pay almost $3.5 million, to the families of two airtanker pilots killed while fighting a forest fire northwest of Missoula in 1994. Killed in the incident were Randy Lynn, a 44-year-old Missoula resident, and 57-year-old Robert Kelly of Alamogordo, New Mexico. US District Judge Donald Molloy ruled that the Forest Service did not provide adequate safety and emergency management training for Kelly and Lynn. Molloy said better training could have saved the menís lives. The two men died July 29th, 1994, when their plane was dispatched to drop retardant on fires burning in the Butler Creek area. Kelly and Lynn survived the crash and got out of the aircraft, but died of burns suffered in the subsequent explosion and fire. P2V-7 N4235T (c/n 726-7285) is getting a late afternoon hosedown; by that time I did not have a clue about airtankers, so I did not ask whether the Neptunes had seen any action that day. Black Hills Aviation Inc was founded in 1958 by Arnold Kolb. The company was sold to Neptune Aviation Services Inc. in 1993. 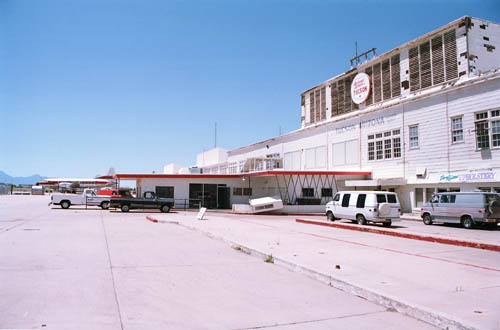 Neptune's main facility is in Missoula; a satellite depot is in Alamogordo, N.M. (anno 2002). 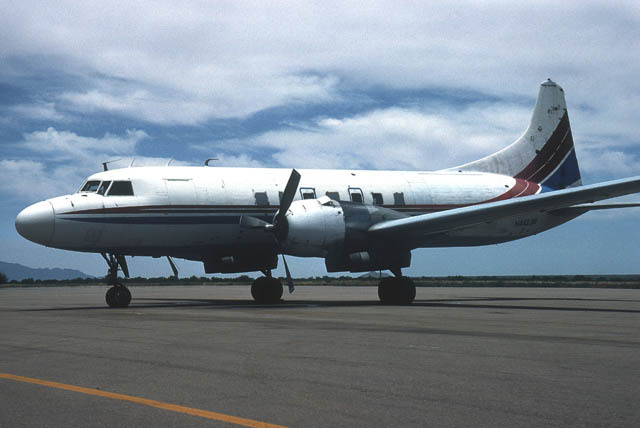 Black Hills Aviation operated Boeing B-17s from 1964-1980. Lockheed P-2V Neptunes were purchased in 1974. The tank system was redesigned and improved on the Neptune in 1978. N4235T is a former US Navy patrol aircraft and used the serial (Bu.No.) 150282 during its service time. Lockheed designed the P2Vs for the U.S. Navy for use as land-based patrol bombers and are suited for the airtanker job because of its relative slow air speed and long ranges. Neptune Aviation also retrofitted other P2Vs to drop retardant, at a cost of $1.2 million per tanker. Neptune's tankers are often on duty from February through November, as the wildfire season moves around the country. The Forest Service stated that each contract plane averages about 120 hours in the air over wildfires per year. But busy seasons have also found increased activities and Neptune's airframes saw 350 hours during the 2000 season. Sadly, Tanker 9 crashed on 01Sep03.
" Tanker #09 operated by Neptune Aviation has crashed shortly after takeoff from Reno/Stead airport. Witnesses report the aircraft was already on fire just after takeoff and was trying to return to the field, but the fire consumed the aircraft and it fell from the sky in a ball of fire. The aircraft hit powerlines on its way down, cutting power to many areas Northwest of Reno. Sadly both crewmembers parished in the crash. Minden/Tahoe on Sunday along with Tanker #25 and SEAT #440. Today (Monday) Tanker #09 continued to work the fire in Hope Valley with Tankers 22(25 returned to Chico) and 440. Tanker 22 had just departed Reno/Stead ahead of #09 between 18:15 and 18:45. Let us keep the families of these brave aviators in out hearts and prayers." Lockheed P-3A Orion Bu.No. 150513 with Spanish Air Force serial 22-25 is seen here stored at Alamagordo,NM. I was told that the Bureau of Land Management (BLM) had bought it, but conversion to airtanker had to wait due to "problems with the paperwork". It was sold to the Texas State Technical College for use as an instructional airframe. This airframe has construction number 5039 and was originally delivered to the US Navy in 1963. 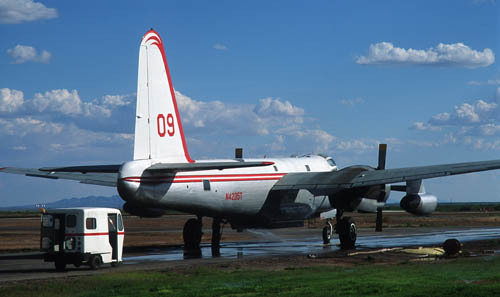 It was registered on 19jun2001 to Aero Union of Chico,CA to convert it to an airtanker. Registration N920AU was assigned to it. The reconfiguration was completed in early-2002. In June 2002 it was in action and reported at Santa Barbara airport fighting "the Wolf Fire", which burnt the forest north of Ojai for several days. The vintage part of Tucson Airport…. Note the damage to the building in the upper righthand corner of the photo. While Tucson Int'l had a modern terminal, the storage area on the other side of the airport appeared dilapidated. A Convair can be seen at the far end and is shown on the following photo below. This model CV340 was delivered to Delta Airlines on 06May53 on dubbed "ship 406". Later, it was converted to CV440. In Feb69 is was stored and classified "withoput further use (wfu)". Fortunately the trail did not end here ! Ransom Aircraft Sales bought it on 03Mar70 and it was operated by Air Transport Inc of Columbus,OH from that same date. This did not last long: W.A.Mims Inc of Jacksonville,FL bought it the next year, on 01Feb71. It was registered to Fred J.Wynne on 05Dec72, but W.A.Mims Inc had it registered to his name again on 18Apr73. There as no love lost between Mr Mims and N4806C as sold it again, a few months later, to Carolina Acft Corp of Ft.Lauderdale,FL (09Nov73). Like so many propliner sit found its way to Florida Aircraft Leasing Corp in Mar74. It took a while to foind a customer: Dow Jones leased it in 1975. As from Apr83 BWI Trading leased it, but this lasted only until somewhere in 1984, when it was returned to Florida Aircraft Leasing. N4806C was stored in May88 at the airport of Oklahoma City. It was transferred to Tucson IAP for further storage, the desert climate ideal for that purpose. My latest reported sighting dates from Sep2001, which had it still stored at Tucson. Then the scrapman payed a visit during 2002 and the registration N4806C was officially cancelled on 29Aug02. 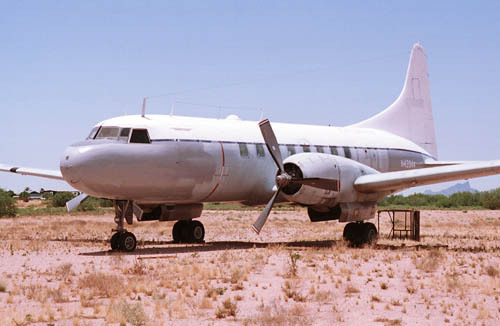 Convair CV600 N94261 (c/n 122) at Tucson IAP. 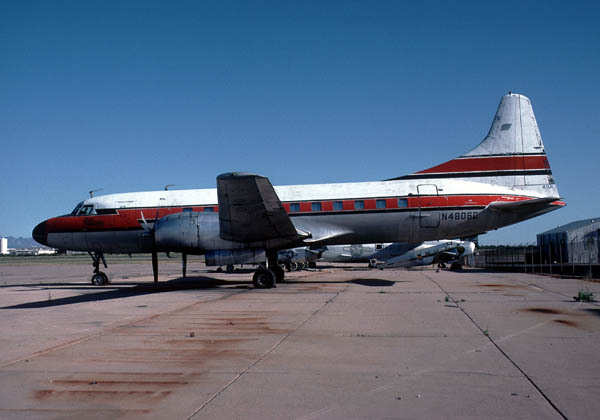 Delivered by Convair ("Consolidated-Vultee") as a model CV240 with tailnumber NC94261 to American Airlines on 10Dec48, it carried 3 names whilst in service with American Airlines: "Ann Arbor", renamed "Rainbow Bridge" in Dec53, which later changed to "Oneida". A famous name in American aviation history appeared as a new owner on 20Nov64: Trans Texas Airways ! It was upgraded to a model CV600. The company name was changed to Texas International on 31Oct68, illustrating its ambitions. In 1968 Wayne Leasing Company of Abington,PA bought it. I have no records for a while, but Feb78 saw N94261 stored at Tucson,AZ. In that same year, ownership was picked up by Bay Aerostar Sales & Service Inc. Maybe the purchase was an investment, as that same year we see ownership changing to S.H.Dupont Jr of Miami,FL. One might wonder what was wrong with this plane as Eugene Pikovsky of Minneapolis,MN bought it in 1979 ! And HiFlite Leasing was registered as owner that same year: on 18Dec79 ! Viking Int'l Airlines (Cargo) leased it for quite a while, from 1980 and even decide to buy it on 05Jul84; but this only lasted till 1985, when N94261 was bought by Corporate Air Inc. In Aug89 SMB Stage Line bought and operated it. In Sep94 we see a familiar name reappear: Viking Int'l Airlines. But that same year it was transferred to another leasing firm: DC Acft Leasing Inc (19Sep94). 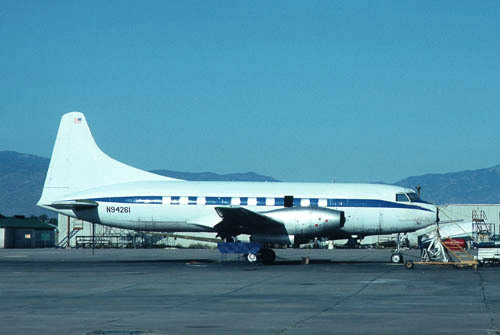 They did not do much with this ConvairLiner, as it was reported stored at Tucson from Apr93 to Oct95. Hamilton Aviation Inc of Tucson,AZ bought it in Feb96. But the registration was cancelled in Aug96. A short word about the model Convair 600: the Rolls Royce Dart 542-4 engine was selected to modify Convair airframes to turboprop power. For the CV240 model this meant a redesignation to CV600. The first CV600 was test flown on 20May65. Trans Texas chose to do their own conversions, rebuilding 25 CV240s to CV600 status (kits were supplied by Convair). In total 39 Convair 600s were converted. CV440 N442JM (c/n 438) at Avra Valley,AZ in Jun93. This airframe was delivered as N9320 to Eastern Airlines on12Jul57. It was reregistered as N442JM for Mackey Int'l Airlines, when they purchased it on 24Dec70, though the actual reregistration took effect on 16Jan71. Mackey Airways (founded in 1957, by Joseph C Mackey of Ft. Lauderdale,FL) was acquired by Eastern Air Lines in 1968, but continued to operate separately as Mackey International; in 1981 operations were terminated. On 24May79 N442JM was registered to Starflite Corporation, and though a sale was reported to American Airways Charters (Air Florida Commuter), the sale probably fell thru. Liberty Airlines took ownership in Apr82, but sold it a few months later to H.Price Jr of Ft.Lauderdale,FL, who payed the bill on 12Oct82. Perhaps mr Price wasn't quite satisfied with the CV440 as Camelot Consultants Inc of Toledo,OH bought it on 07Nov83. This lasted until 08Apr87 when SOL Aviation Corporation of Miami,FL was registered as owner. Maybe it was seized later down the line, as the US Marshals Service of Arlington,VA had N442JM registered in their name on 09Dec92 ! 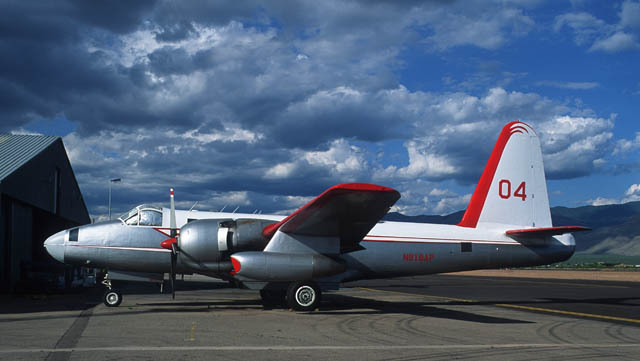 N442JM found its way to the desert when Central Air Service of Tucson,AZ had it join its fleet in Jan93. It was reported stored at Avra Valley,AZ in May95. But Starship Inc bought it in 1996 and exported N442JM to Mexico during Aug96. During Feb.2003 it was confirmed to me by 'Wings of Hope' (for over 40 years involved in humanitarian work) that they (had) operated this Convair (as XA-TDL, according to other sources), but had it for sale at Chihuahua Airport; it had proved to be a too big a plane to use effectively (http://www.wings-of-hope.org/index.html). I found that website www.wings-of-hope.org no longer active. I did find a Wikipedia hit: en.wikipedia.org/wiki/Wings_of_Hope_(charity). A message on Classic-Propliner (Yahoo) forum was posted: "... sent me these photos taken at Chihuahua, Mexico today. The aircraft with the blue cheatline is CV440 c/n 438 XA-TDL. 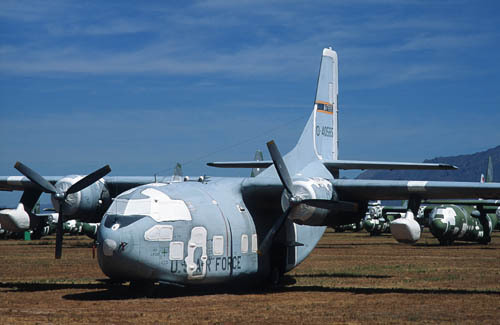 The aircraft with the yellow/green cheatline is C-131A/CV240 c/n 53-11 and is marked XA-TDF. A number of my references say that the C-131A/CV240 is registered XA- JRS. Does anyone know if this aircraft was subsequently re-registered XA-JRS?" To which was replied: "the aircraft XA-TDF was never re-registered XA-JRS". And: "XA-TDF was leased for some time to Mexicargo; its tail [still] has the Mexicargo logo; Mexicargo was the new project of the same owner at the end of Linea Mexicana de Cargo life." 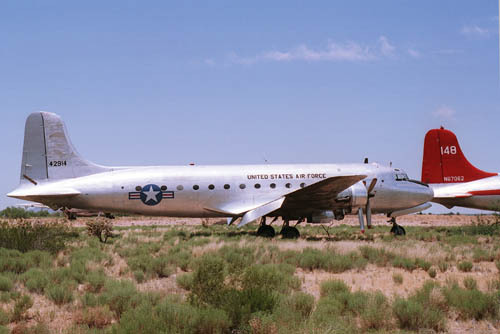 Delivered to the US Air Force with serial 48-0609 on 31Dec48, it found the end of its military service life in Mar68 when it was stored at Davis Monthan AFB, Tucson,AZ. Christler Flying Service Inc bought this airframe on 05May70 and registered it as N9464 on 10Jul70. It continued as a sprayer for a Canadian company named Beaver Air Spray Inc, which had tailnumber C-GXKO assigned to it in Jun79. The next year it was Conifair Aviation Inc which bought this "Connie". It returned to the USA as N494TW for moviestar and "plane nut" John Travolta (registered in the name of Star of Santa Barbara Inc) in Sep84. N494TW was stored at Ryan Field, near Tucson, awaiting restoration, but this did not materialize. Vern Raburn picked it up in 1987 and restoration was started in Sep91 in the in the colourscheme of Military Air Transport Service (MATS) and had its original serial put on the tail: 80609 (48-0609). Vern Raburn is the founder of the Constellation Group. In 1992 N494TW made its first public appearance and since then "the MATS Connie" has been the "Queen of the Sky" at many air shows. Click this link for info on Conifair and the Budworm Sprayers by Stephen Piercey (published by permission). Graham Robson sent me this air-to-air shot and Paul Schaack sent me photos in 2005 whilst en route to its new permanent home in S.Korea. Near a parachute center at Avra Valley some aircaft were stored and this photo shows three of them: Convair CV240 N81599, Fairchild C-119 N175ML and Convair C-131B N43944. I visited this location again in May 2008. DC-4 42914 is seen here in basic USAF livery; though parked in the desert grass, it looks like it can take off on short notice. 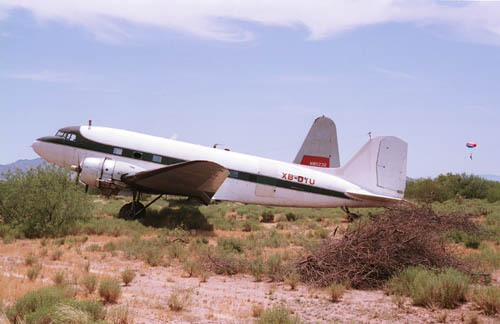 This is a DC-4-1009 (at one time officially registered N31356) with c/n 42914. It started life with Northwest Airlines in 1946. After W.W.2 Douglas offered this updated variant of the C-54 trooptransport; it was purely a passenger transport with room for 5 crew and 44 passengers (for day use) or 24 passengers as a sleeper transport (one was expected to lie down while travelling thru the night !) . Later, the DC-4-1009s and ex-military C-54s were reconfigured to a "high density seating" of 86 passengers. It had incorporated many improvements over the C-54. This Skymaster operated with Air New-Mex in the early 1960s and went to Lufthansa in 1963 on a lease. It went thru various owners and was sometimes stored before another sale was made. Bill Dempsay / Central Air Services bought it in 1982 and I found it stored in the Arizona desert. And then, on August 08th 2002, almost 10 years later, it made a 10-mins. testflight ! 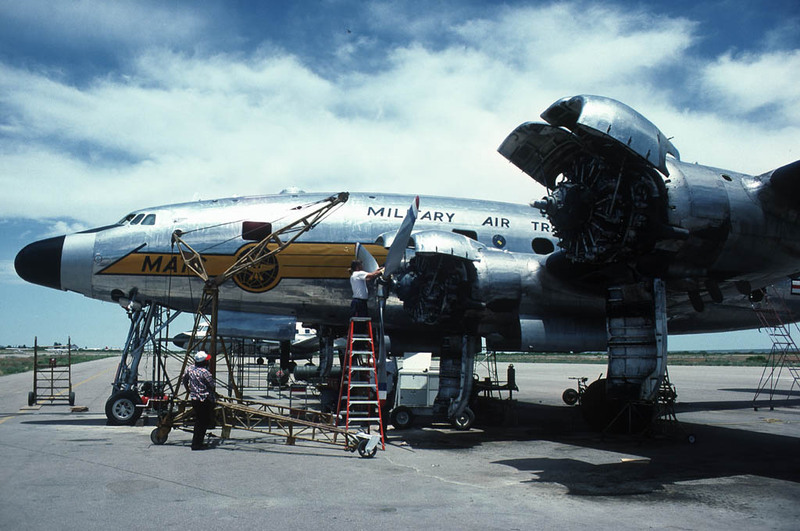 A few months later it ferried to the UK, so it could participate in shooting a tv-film or movie about the Berlin Airlift (this should take place in 2003). It ain't over for these hardy transports, until the scrapman has come to take the last pieces to his smelter! 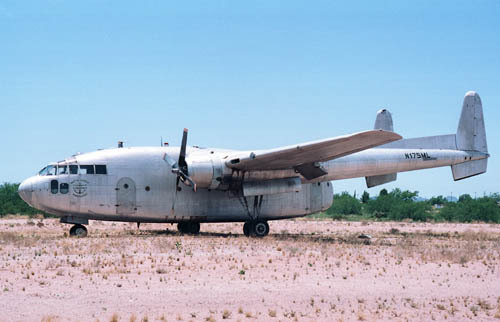 Fairchild C-119F (R4Q-2) N175ML (c/n 10844), with 'Marine Lumber Co. Nantucket' titles on the forward fuselage, stored at Avra Valley. It was formerly operated by the US Marine Corps with Bureau Number (Bu.No.) 131677. The Marine Corps operated 41 R4Q-1s (C-119C) and 99 R4Q-2s (C-119F) in all their transport squadrons. The R4Q-2 featured 2 Wright R-3350 engines. These "Packets" (a.k.a. "Flying Boxcars") were replaced in 1961 by the Lockheed C-130 Hercules. N175ML was registered on 06Mar95 for the Mid- Atlantic Air Museum, which is located at Reading Pennsylvania's Regional Airport (Carl A. Spaatz Field - KRDG). The Museum's collection includes warbirds, classic airliners and historic exhibits; it is open 7 days a week. After its military service (which ended in 1961 ? ), it entered the civil register as N48543: for the Marine Lumber Company ? To whom (and since when) this Flying Boxcar was registered in 1993 as N175ML, I don't know either (nor since when it was registered as such). Additions to the history of this aircraft are more than welcome ! Unfortunately, the restoration was delayed; the project leader had taken a job which prevented him from putting in much time and due lack of workforce and funding, the restoration had progressed very little. Aircraft acquisition is a lot easier than finding a place to keep them and the people and money to restore them. Right now it's in a private hangar, so at least it's out of the weather. I have Fred Pierce to thank for this update (Feb03). Delivered as 53-7802 to the USAF during May55, it service career lasted until its storage at Davis Monthan AFB during 1970s. It entered FAA's register as N43944 for Air Freight Int'l Inc, which bought it in Jul92. Only a few months later, Central Air Service Inc took ownership, in Dec92. It did not get far and found itself "without further use" stored at Avra Valley, where I photographed it in 1993. Maricopa Acft Services bought it on 20Jun00. When I checked the FAA's records on the Internet in Feb03, I found it registered as N404TC on 10Mar2001, in the name of N404TC Inc, a Delaware corporation. From another source, I received the update that it was bought by Rob Diver on 07Jan02 (as N404TC). News on its present location and use will be welcomed. This Douglas airframe, with construction number (c/n) 19057, was delivered on 08Nov43 to the US Army Air Force; during 1944 it saw service at Oahu. To the War Assets Administration (WAA, US surplus disposal after March 1946) on 07Aug46. It entered the civil register as NC67578 for E.A. Stewart (operating as Stewart Air Svces) on 01Sep46. Stewart Air Service operated from Hawthorne, CA, In May 1969 it joined XA-TEH Aerolineas del Pacifico of La Paz, Bolivia as XA-TEH; this seems to have lasted until 1978. It was reregistered from XA-TEH to N-number (US) on 11Aug92, but maybe the sale fell thru as I photograped it as XB-DYU in 1993. It was reported still stored during Oct94. It seems that XB-DYU has been scrapped to provide spares to rebuild C-47B N3753N (c/n33604 of Central Air Services, former USAAF 44-77272), but confirmation would be welcome. Lockheed Neptune N80232 (c/n 726-7198) in storage under the hot desert sun at Avra Valley, a.k.a. Marana Regional Airport. It was reported still stored during June of 2002. FAA's register on the internet had this former US Navy patrol aircraft (Bu.No. 147948) registered on 1Nov2000 to Maricopa Aircraft Service (of Tucson,AZ), but sources on the internet seem to indicate that this firm has gone out of business. Many Neptunes were withdrawn from the US military services during the early 1980s, but I would welcome info on when this P2V-7 was converted to airtanker and by whom (Aero Union ?). 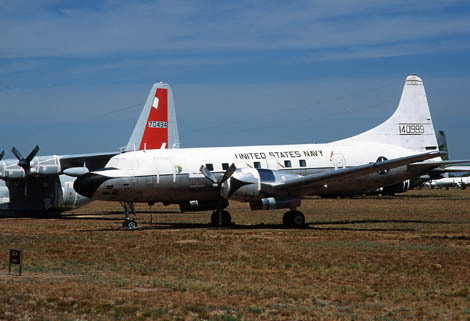 Convair R4Y-1 (the designation was changed by the US Navy in 1962 to C-131F) 140999 at the AMARC in June 1993. It was delivered to the US Navy in Oct55. It also operated in Europe. N140999 was stored in the vast storage center near Tucson in 1984. It entered the civil register as N14099 for the National Museum of Naval Museum in Nov92. But apparently someone thought there was far too much life left in this airframe to prserve it, as it was registered for the Seco Aviation Company in Aug93, only months after I photographed it. N14099 was then bought by Tenn GA Leasing Inc in Jul94 and purchased by Robinson Air Crane on 11Feb97. The registration was changed to N8277Q for Jet Sales International, which bought on 13Apr99; unfortunately, it was stored again at Fort Lauderdale,FL that same month.The next year it was bought by World Jet Inc and sold again in Feb02 to Kestrel Inc. It may have flown under registration P4-SSG for Super Shrimp Flight, Aruba from May98-Apr99. It was reported during 2000 to carry the name 'El Generalito' under the cockpit window and the tailnumber was applied as N-8277Q. This vast desert storage center for the US military aircraft is located at Davis-Monthan Air Force Base in Arizona, near Tucson. "AMARC" translates as Aerospace Maintenance and Regeneration Center, indicating planes just don't get stored and scrapped here, but also find new destinations in a military role or on a civil register. In April 1946 the 4105th Army Air Force Unit was established here in Arizona. 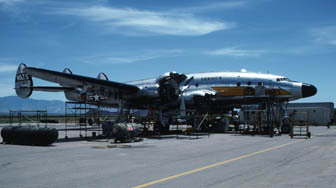 It was to provide a storage location for the large number of aircraft no longer required by the Army Air Force following the end of World War 2. In 1947 the United States Air Force was created as a seperate service. 1948 saw the unit change its name to the 3040th Aircraft Storage Depot and many more name changes followed. 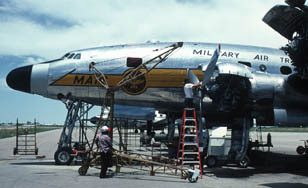 In February 1965, the centre was renamed the Military Aircraft Storage and Disposition Center (MASDC). The mid 1960s also saw an escalation of the Vietnam conflict and the center provided many aircraft and parts. By the end of the Vietnam War, many aircraft found their way to the MASDC again. At the end of 1973 the total number of aircraft present at MASDC reached 6,080, the all-time highest number. C-123K 54-4711, 55-5517, 55-5567; UC-123K 54-0583, 54-0585, 54-0586, 54-0605, 54-0607, 544618, 54-0628, 54-0635, 54-0685, 54-0693, 54-0701, 554520, 55-4532, 55-4544, 55-4547, 55-4571, 55-4577 and 56-4371. It was delivered from the factory to Safair of South Africa as ZS-RSG. Later identities were N250SF, N515SJ, N902SJ and meanwhile it has been operating as S9-CAJ for Air Transafrik, which has its headquarters in Luanda, Angola. 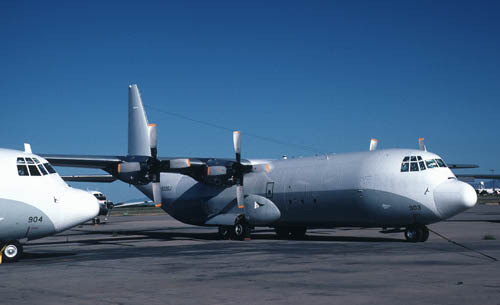 Transafrik is a large Hercules operator with 12 aircraft in its fleetduring year 2002.